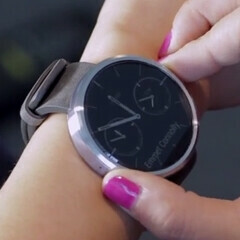 Although Motorola is still not ready to reveal a full list of Moto 360 features, the company today posted an official demo video that showcases some of the smartwatch’s capabilities. Of course, we already have our own Moto 360 hands-on from Google I/O, but it’s nice to see Motorola presenting the smartwatch itself. In the demo video, Motorola product marketing manager Cathay Bi gives us a walkthrough of the Moto 360, confirming that it comes with a stainless steel case, and a genuine leather wrist strap (we assume that this is customizable anyway). Running Android Wear - just like Samsung’s Gear Live and LG’s G Watch - the Moto 360 displays notifications at the bottom of its screen. These can be dismissed the same way you’re doing it on an Android smartphone. You can also take (or reject) calls with the Moto 360. As previously reported, the Moto 360 will be released “later this summer” for a price that hasn’t been announced yet. Earlier today, Motorola revealed the winning design of its watch face contest - which might be used as one of the faces for the commercial version of the Moto 360. Unlike everyone else here (who are literally drooling over 360), I think it looks huge and uncomfortable. If Moto wants me to pay above $150 just for a watch to tell me weather and notification, they can take their business somewhere else. No why they got sold twice already. They couldn't have found someone with smaller wrists to show it off, and it still looks fine. I'm not worried about it. If the device was any smaller it would mean either taking a hit from the battery compartment or having a smaller display. I would rather be able to comfortably read what is on the display from a distance than have to bring the watch up to my face to see what's on it. I think consumers will agree. Just out of curiosity, what do you think is the typical cost of a watch that tells the time and date? $100-$180 for something decent, or $20-$100 if you want a Casio watch from walmart with a monochrome face. And there are watches that cost in the thousands to tens of thousands, and still don't have anywhere near the functionality of a smartwatch. I stopped wearing watches when cell phones put the time on their screens. But for things like checking email or texts, especially at a function where you don't want to be pulling your phone out all the time, this will be much more discrete. The mole on her arm is very distracting. This is the 1st smart watch that has potential. When the iWatch comes out you be ALL OVER drooling and be the FIRST ONE IN LINE. And this have the same design as a real WATCH rounded circular design. Not square. I prefer the 360 over the Galaxy Gear or what ever the iWatch looks like. Does it or does it now have a speaker? They keep showing the someone calling screen but they always dismiss it. If they accept a call do they then have to pull out their phone? It looks too big. And thick. Would you really get rid of a phone for just a watch? You would be fine with going to websites and typing things on a watch? That seems a bit extreme to me. I like the idea of a watch being an extension of a phone. A watches dimensions are simply too small(even though dedicated phone watches are huge!) to completely replace the many uses of a smart phone. I like having a 5 inch display smart phone to do things on and I also like the ability to have a watch that acts as a controller of my phone. No, they are accessories for your phone. Cool but I'd rather do all that on a phone. I'm still curious does it have to be connected to the phone? or is it in the cloud similiar to the GOOGLE GLASS. From what we know, it has to be connected to the phone over bluetooth, but based on the leaked specs from best buy, it has wi-fi support so it may be different from the other two android wear devices in that it can be in the cloud. I find it a big Fail. You have to press and hold side button or tap and hold screen to turn on display. That is a big fail. Did any of you guys catch that? A wrist watch needs to be on with no interaction. Needs a gyroscope/accelerometer in in it to auto turn on when you put wrist in motion to view. I mentioned that on another site, and was told apparently on the promo videos they did at I/O, they also have the ability to turn the screen on through gestures similar to the twist for camera on the Droid series phones. I thought it had "always on" Google Now. I love how this looks. However, I notice a black bar/area on the bottom of the moto 360 screen. It's just black. Even when you go into the watch mode, that area is covered in that black bar. What is that? Is it permanent? cuz if it is that makes it look really ugly and weird. The display is not a full circle. That little black bar at the bottom is for the display drivers, meaning the hardware that runs the screen is sitting in the little black bar. It is permanent, but without it, the screen wouldn't work. The reason they had to put the black bar there was because the watch was round as opposed to the square shape of the LG and Samsung watch which could hide the drivers under the black bezels around the entire screen.